Why, yes! We like quilts too! So, the fog hung around for a long time this morning, and gave me the opportunity to do some picture-taking of my last project! It’s still in the “secret sewing” collection, even though it is finished! But here’s a snippet of a shot I took, and with a couple photo-bombing! They seemed to like the action but were a little too shy to get any closer. Hopefully I can share the full quilt with you soon, but in the meantime; shout out to Cynthia Brunz of Quilting Is More Fun Than Housework for the great quilting! This is my most popular class pattern of all time. Most guilds will choose it because it looks complex, but is simple enough to finish in a day-long class. Originally it was designed as a baby quilt, but I’ve also used it for a throw and a wall hanging. It finishes at 40″ x 50″ and takes mostly 1/4 yard and 1/2 yard cuts of fabric. It really is a fun quilt to sew together, and can easily be that last minute gift you pull from your stash. You can cut and sew it together in 4 hours! Use the Craftsy icon in the left column to get to my Craftsy Pattern Shop. You will make this quilt over and over! The name says it all, you will finish this one in a New York Minute! Be sure to check out the latest issue of American Patchwork & Quilting! My Hidden Agenda quilt is featured, along with it’s companion just Bright! My plan as I was designing this quilt was to use the piecing lines as registration marks for quilting. That helped in a couple of ways. First, I didn’t have to mark the quilt to prepare for quilting and second, I didn’t have to get rid of any markings later! The quilting may look complex, but that is only because there are a few steps to complete it. But each step is fairly simple and even considering the large size of the quilt, didn’t take all that long! I’m really proud that AP&Q chose this quilt to be included in the magazine, and BY THE WAY the photography is spectacular and very creative! Get you copy before they’re sold out! Just noticed that All People Quilt was featuring some cozy flannel quilts on their weekly newsletter today! I thought I should check it out, and what did I find but MY QUILT Wintergreen featured on the first page! What fun to see it again in a wonderful setting. This quilt is on my guest bed right now, awaiting our company for Christmas. It is made of flannel, and homespun, both plaids and prints, and even a stripe thrown in for good measure! I used a shot cotton backing as I wanted to keep it light, but I used a wool batting for the warmth. The quilting is pure fun: a large paisley in the plain blocks with contrasting thread so it would show against the print, and horizontal zig-zags in the background. My good friends helped me meet the deadline: Wendy Fast pieced the quilt top and Lisa Bee Wilson of Towerhouse Quilts did the quilting on this one. It’s fairly loosely quilted so the loft of the wool is maintained, and believe me, this is a cozy one. All People Quilt is offering it as a free download now, but originally it was published in “Quilts and More“. I hope you will send me a pic when you finish yours! While working behind the scenes is very rewarding and gives a great sense of accomplishment as I check things off the to-do list, it’s so fun to get to the point of being able to share my latest project with everyone! I’ll be teaching at a BIG EVENT this summer (more on that later) and am finalizing plans by dropping off the “virtual” pattern, photos and sample blocks to my wonderful graphic artist Barbara Gleason! Next, she will make it beautiful, legible and clear, put the photos just where they should be and return it all by email for a final edit. This quilt uses some fun fabric from Maywood Studios, called “13 Going on Thirty”! Very soon it will become a downloadable pattern! It’s exciting to learn how to make this all happen, I’m so glad to have some experts around to help me figure it all out! This table runner was inspired by my little quilt group! We gave each other a challenge to make blocks of bright batiks on a black background. I loved the effect, and had this project in mind from the beginning. This runner provided instant gratification because of how quickly it went together, especially since I still haven’t finished thw quilt we were supposed to make! The quilting it was pure fun, I used a turquiose thread which I knew would be outstanding on the black background. You might have three stray 12″ blocks waiting for the perfect project, and you could use them here! If you do please send me a picture so I can post it for everyone to see. Find the pattern in my book, “Perfect Fit Pieced Borders”! “A New York Minute!” Featured Quilt of the Week!! 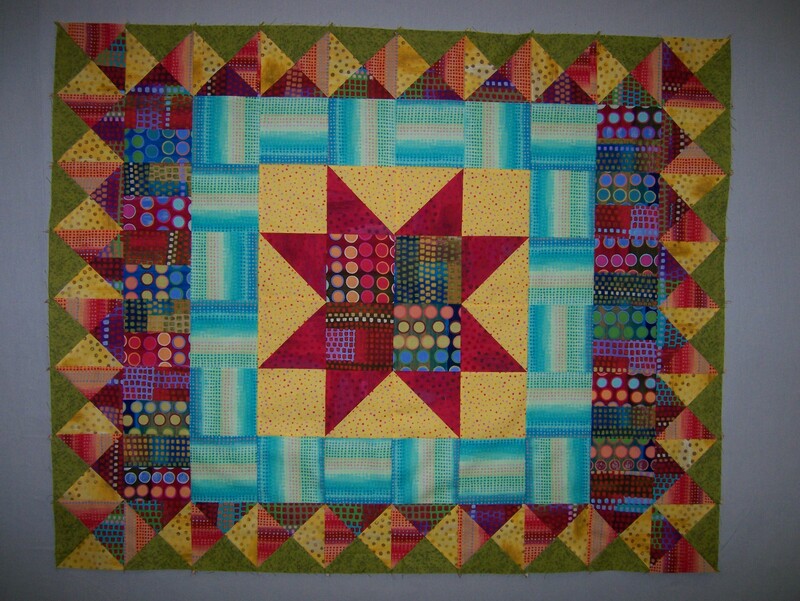 Quick as a “New York Minute”, this quilt can be finished in time for that last-minute gift. I’ve made so many of these fun quilts and have begun to think of them as my quilt “missionaries”, sent out all over the country to keep the babies warm! It’s a perfect size (40″ x 50″) for a crib, or for a small throw/lap quilt. The secret to finding a good collection of coordinating fabrics is to choose the stripe first. You’ll find it in my new book Perfect Fit, Pieced Borders. Look in the gallery for a few more pictures of this quilt in different fabrics. Try it, betcha can’t make just one! 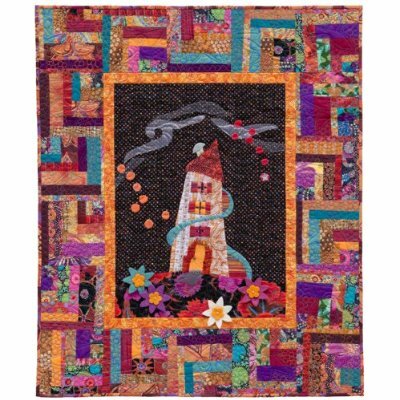 “Stargazing” – Featured Quilt of the week! The Milky Way, the Big Dipper, and the Little Dipper seem to fill the night sky and light up the castle in a dreamland. This fun appliqued and pieced project was inspired by my friend Tonye Belinda Phillips, a wonderful applique artist. Be sure to check out her web site www.tonyebelindaphillips.com and see for yourself why she and her work are so inspiring. I was also thinking of a trip I had taken with my husband to Crater Lake, Oregon. We stayed at the historic lodge and were up late into the evening stargazing at a breath-taking sky. The early morning sunrise over the rim of the crater was equally impressive. So much to be inspired by, so little time! Of course this is a pattern from my latest book, “Perfect Fit Pieced Borders”. It uses some fun embillishments including wool, velvet and organza as well as quilting cotton, and then is finished with a fun quilt design. Hope you will try a version of your own!